– Halve, peel and de-seed pumpkin and butternut squash. Cut into 1″ cubes and set aside. – Chop onion and cook over medium-low heat in a large, heavy bottomed soup pot with coconut oil and garlic. Cook until onions are softened, being careful not to burn the garlic. Add curry (start with 1/2 tablespoon and add more as it cooks and you can adjust to your preference). Cook for an additional minute. – Add pumpkin, squash, vegetable stock, 2 cups of water, salt and pepper. Bring to a boil. Reduce heat and simmer over medium/low heat until squash and pumpkin are easily pierced with a fork. – Let cool enough to transfer to a blender and puree. Adjust salt and curry after blending. 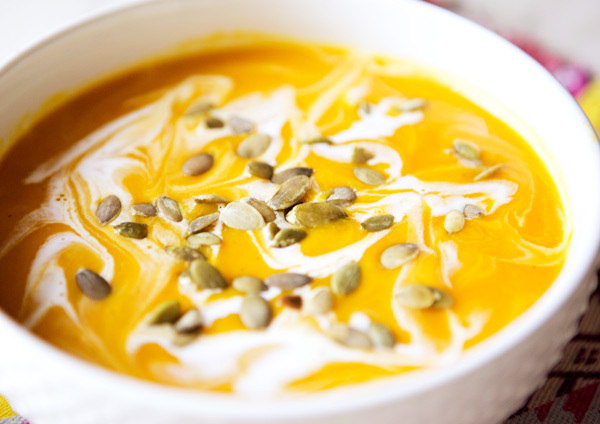 Serve hot with a goood swirl of coconut milk and a sprinkling of pepitas. I'm so with you on this! I LOVE soup season, and this recipe is perfect for this chilly autumn day in Connecticut! This looks incredible! I love soup in the winter too and this flavor combo is killer. Ahhhh this looks amazing. Perfect for a chilly fall day like today! Butternut squash is one of my all-time favorites…thanks so much for sharing! Sarah, may I ask what your diet is specifically? It definitely seems vegan but bordering on raw maybe? So simple and so delicious! Love the combination of pumpkin and coconut. How many cups/servings you get out of it? I keep saying this everywhere, but pumpkin is my favorite thing in cooking and desserts! I love pumpkin soup!! 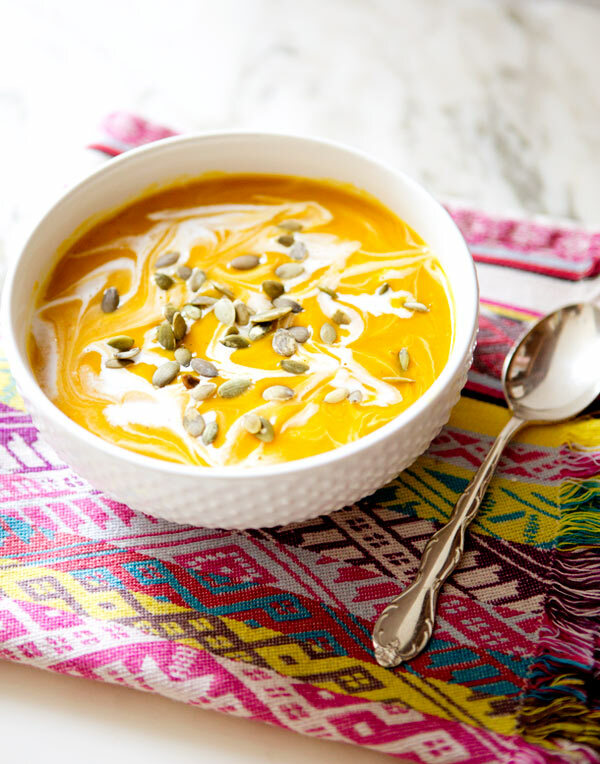 I love that this recipe mixes pumpkin and buttersquash – I will have to add this to my list of wintery soups to be had!! I am totally with you on this! I am getting into holiday mood and I've been cooking all those heavenly delicious soups and kicked off the fall season with a rich bowl of minestrone with butternut squash of course. 🙂 I am going to try this recipe this weekend.